I was pretty worried this morning. Tom was still working on the client proposal, my computer battery was running down and we had a 2.5 hour drive to get to Edinburgh, then find the hotel and check in, then locate the ticket office for our will-call tickets before the Tattoo. Luckily, the show didn’t start until 9:00pm. Tom finished his work and got it sent off just after 1, so we packed up stuff we needed for overnight and drove back down to Edinburgh. Over on the left, I saw what looked like an abandoned castle near Kingussie. I wasn’t able to get a picture that time but I knew we’d drive by at least 2 more times before heading home. I had bought Tom a book for Christmas (Fodor’s Scotland) and it mentioned my “castle” in it – it was actually the Ruthven Barracks. The impressive and nicely proportioned mound on which Ruthven Barracks stands is said to be a natural leftover of the retreat of the glaciers at the end of the last ice age. Its regularity suggests that man has taken a hand as well. The mound overlooks the site of an ancient ford and ferry between it and today’s Kingussie. This was one of the few crossing places of the middle reaches of the River Spey before it was bridged near Newtonmore in 1808, and it lies at an important junction of the routes through the Cairngorms. The first recorded castle to be built here appeared in 1229. By 1371 it formed the centre of activity of Alexander Stewart, Lord of Badenoch, and younger son of Robert II. More popularly knows as the Wolf of Badenoch, Stewart is mainly remembered for falling out with the Bishop of Elgin and being excommunicated by him for marital infidelity. In retaliation he destroyed Elgin Cathedral, and much of Elgin in 1390. This first castle was destroyed in 1451, but rebuilt by 1459 as a much grander fortification. It was fought over during the Civil Wars, then badly damaged by Viscount Dundee, Bonnie Dundee and the Jacobites during the first uprising in 1689. After the 1715 Jacobite uprising, the Government decided to tighten its grip on the Highlands by building four fortified barracks in strategic locations. Ruthven Barracks was one of them, and all remains of the earlier castle were removed to make way for the structure you see today. The barracks took much longer to build than planned, and was finally completed in 1721. The barracks were designed to house 120 troops, split between the two barrack blocks. Officers lived separately. The stables, standing slightly to the west of the rest of the barracks, were built in 1734 to house 28 horses for dragoons. By this time its strategic importance had been enhanced by the building of General Wade’s military roads from Perth, Fort Augustus and Inverness that came together here. 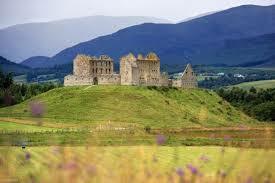 In August 1745 some 200 Jacobites tried to capture Ruthven Barracks. A force of just 12 redcoats, commanded by a Sergeant Molloy, fought them off with the loss of just one man. By February 1746 Sergeant Molloy had been promoted to Lieutenant, and was still in command when a larger force of Jacobites arrived, this time equipped with artillery. The garrison surrendered. History had one more, final, role in store for Ruthven Barracks. On the day after the Battle of Culloden as many as 3,000 Jacobites assembled here under Lord George Murray with the intention of fighting on. Awaiting them was a message from Bonnie Prince Charlie saying that each man should save himself the best he could. The Jacobites set fire to the barracks, and dispersed to try to evade a Government now set on finally suppressing the Jacobites, and the Highlands, once and for all. What visitors to Ruthven Barracks see today is pretty much what was left by the departing Jacobites on 17 April 1746. Most of the exterior walls remain, but little of the interior structure, and no flooring or roofing. But come here on a quiet day and you can have Ruthven Barracks entirely to yourself. The distant traffic on the A9 barely intrudes, and it takes very little effort to transport yourself back 250 years to the days when history was being made here. And, if it’s really quiet, and getting dark, watch out for ghostly chess-players. It is said that one evening in July 1394 a visitor dressed all in black arrived at Ruthven Castle and challenged Alexander Stewart, the Wolf of Badenoch to a game of chess. By morning, no-one was left alive in the castle: for such are the perils of playing chess with the Devil. Also, along the way, we saw amazon.com.uk and I got a picture of that our last day. We got into Edinburgh and looked for our hotel with the very clever name – the Edinburgh City Hotel. I had chosen that because it was fairly close to the castle and I knew we’d want to stay overnight since the Tattoo didn’t get over until 11:30 and it was a long ride back. We checked in and got settled in a bit. I was reading the info about the hotel and found that they had adaptors for rent. Oh, happy day! I immediately started charging my computer again. I don’t remember eating anything this day but I must have had something, somewhere. The hotel is only 10 minutes from the castle but I hadn’t realized we needed to walk further to get our tickets. Fortunately, we left early enough to accomplish all this. 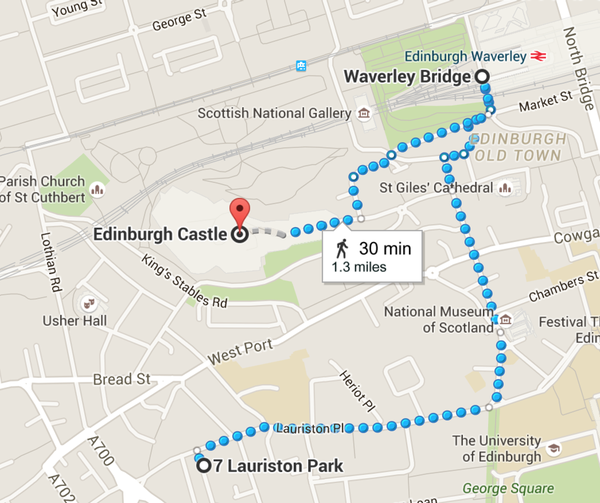 We set out to walk to the castle and to the Waverly Bridge where the ticket office is. We walked by the huge queue filling up the wide Royal Mile to the castle, then on to the News Steps. 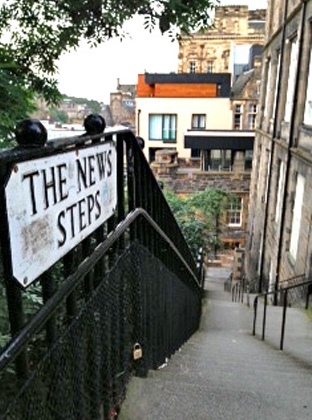 This picture doesn’t show the turns in the steps – there are 134 of them – between St Giles Street and Market Street. At the ticket office we picked up our tickets for the Tattoo and a double decker bus ride for the next day. Then, we contemplated walking back up the stairs, up the Royal Mile to the castle and decided to take a cab. The driver said it was only a short walk but I was already exhausted and I knew we had to do the all uphill Royal Mile since it’s closed to traffic. We were dropped off at the bottom of the hill and joined the mass of people waiting to go up the hill for the Tattoo. The Fringe Festival was also happening at the same time and there lots of people attending those activities. The street layout, typical of the old quarters of many northern European cities, is made especially picturesque in Edinburgh, where the castle perches on top of a rocky crag, the remnants of an extinct volcano, and the main street runs down the crest of a ridge from it. This “crag and tail” landform was created during the last ice age when receding glaciers scoured across the land pushing soft soil aside but being split by harder crags of volcanic rock. The hilltop crag was the earliest part of the city to develop, becoming fortified and eventually developing into the current Edinburgh Castle. The rest of the city grew slowly down the tail of land from the Castle Rock. We found our seats which were in a pretty good section and waited a short while for the Tattoo to begin. The announcer did the typical thing finding out where the audience was from. I was surprised to hear a large contingent from a high school in Alaska cheering. When I went on school trips, it was usually to the next town, not overseas! The folks near us were on a Seabourn cruise. The next day, we saw their ship in the harbor. There were folks from all over the world. – 70% of the audience comes from outside Scotland. Half of these are from overseas. The Tattoo as a whole was wonderful. There were some things I didn’t like as well as others but that’s me. I loved the pipers, the drummers, the lights on the castle, the Lone Piper, the Black Bear, Scotland the Brave (the ringtone on my phone!) … All the truly Scottish things. I wasn’t so wild about the Indian Bollywood number, the Chinese dragons floating around or the Highland Dancers. They weren’t bad but they weren’t what I really came for. When I think of Highland Dancers, I think of men doing sword dances – but I can’t have everything! I am a huge drumming fan so another favorite of mine was the Swiss Top Secret Drum Corps. The Military Band of the People’s Liberation Army of China played my all time favorite hymn – Abide With Me. The show, even through it lasted 2.5 hours was over all too soon. We headed down the hill with the other 8,800 attendees, then turned right to go back to our hotel. On the way, we stopped at a tiny store and got some junk food for dinner. What a fantastic event – and now, I’ve fulfilled my 1-item bucket list. I want to go back! For the record – The word ‘tattoo’ comes from the closing-time cry in the inns in the Low Countries during the 17th and 18th centuries – ‘Doe den tap toe’ (‘Turn off the taps’). This is a commercial for the Tattoo which ran in the UK. The world is coming together for the 66th Tattoo! 2015 will see the world’s most spectacular military Tattoo host a parade of talent from 4 continents as the show piece event celebrates ‘East Meets West’. All the traditional ingredients will be present – massed pipes & drums, massed bands, the Lone Piper along with a number of impressive overseas offerings – but some will be contributing a new look to next year’s Royal Edinburgh Military Tattoo (7-29 August 2015). Among new features will be one of the most popular military college marching bands in the United States, the 70-piece Citadel Regimental Band and Pipes, who will travel to Scotland from Charleston in South Carolina for August’s 66th Tattoo, while over 100 musicians and a cultural item from the East is also expected to add an unexpected new dimension to proceedings, as the showpiece military event celebrates ‘East Meets West’. For the sixth time in the Tattoo’s history, Switzerland is to provide participants who will also play a part next summer. The Swiss contingent, Top Secret Drum Corps, featuring 30 top percussionists from one of the world’s most sensational marching rhythm groups, will display an unpredictable style and dynamism that has drummed its way into the hearts of Tattoo spectators on four previous occasions. New features will also include an exciting appearance by the Royal Air Force, which is set to observe the 75th anniversary of the Battle of Britain in 2015. To mark this important occasion, which continues to occupy a special place in the hearts and minds of the British public, RAF Pipes and Drums, the RAF Squadronaires together with the Queen’s Colour Squadron will present a spirited display of piping, drumming, dance band classics and precision drill that is expected to delight audiences throughout the 3-week Castle Esplanade spectacular. And along with the Massed Pipes and Drums will be some of the foremost services bands in the world, The RAF Massed Bands embracing representatives from The Central Band of the Royal Air Force, The Band of The Royal Air Force College and The Band of the Royal Air Force Regiment in company with The Band of the Royal Regiment of Scotland, with over 120 musicians drawn from across the UK. “This year – we are already working as if it were 2015 – we are delighted to be supported by the Royal Air Force under their Principal Director of Music, Wing Commander Duncan Stubbs. The RAF bands have huge quality and depth, their presentation is first rate and, their music is both excellent and broad in its appeal. Of course, in 2015, we will be marking the 75th anniversary of the Battle of Britain. This offers a splendid opportunity to showcase all the RAF have to offer. We are all thoroughly looking forward to honouring ‘The Few’” commented the Producer. From the United States will come a Highland Dance contingent who will join forces with the Tattoo’s own Highland dancers to offer a selection of colourful, complex and compelling dance patterns. The 90-minute production will also feature the return of the Crossed Swords Pipe Band from Berlin. German composer and co-writer of the popular bagpipe melody ‘Highland Cathedral’ – Berlin-based Michael Korb – a band stalwart, may well perform at the event alongside the 25-strong group of pipers and drummers , as the Tattoo’s first German pipe band, ‘The Crossed Swords’, take to Edinburgh’s famous Castle Esplanade for a second time. The Royal Edinburgh Military Tattoo, which is set-up and run for charitable purposes, is grateful to official partner, The Royal Bank of Scotland, for its continued support. Rhidian Taylor, Head of Brand at RBS said: “2014 proved to be yet another fantastic year for The Royal Edinburgh Military Tattoo. As Scotland’s most prestigious and internationally renowned event, we look forward to welcoming our customers and being part of the team making it happen for 2015”. Tickets for the 2015 Tattoo (7-29 August) will be available online at http://www.edintattoo.co.uk and over the phone Tel: 0131 225 1188, from 10am on Monday, December 1st 2014. Counter Bookings from the Tattoo Ticket Sales Office at 32-34 Market Street in Edinburgh, will be accepted from Monday, December 8th. My slideshow, including some short videos. One of them was turned sideways for some reason – I have no idea why! The first image is our hotel. I like this video of The Black Bear with the pipes and drums marching down The Royal Mile. It is customary to yell or roar during this song. In most Scottish infantry regiments of yore it was customary for a battalion led by the Pipes and Drums re–entering their barracks after say a route march to play the tune. Often the drummers and the soldiers would roar/yell very loudly when the tune came to the fourth bar, two beats to further herald their arrival. Professional videos. I think this one might have been the TV show. “From the unique setting of the Esplanade of Edinburgh Castle, the 2015 Royal Edinburgh Military Tattoo marks the 75th anniversary of the Battle of Britain, with the Massed Bands of the RAF and the Queen’s Colour Squadron taking centre stage. East meets west at the Royal Edinburgh Military Tattoo, with the east represented by a Bollywood dance extravaganza, the Military Band of the People’s Liberation Army of China and the Changxing Lotus Dragon Dance Folklore Group. From the west, the UK home team are joined by the Citadel Regimental Band and Pipes from Charleston in South Carolina and the United States Air Force Honor Guard, based in Washington DC. The following are fantastic but they were done at the dress rehearsal and photographers and others were allowed on the esplanade. 1: This is the opening act, the massed pipes and drums, sorry about the interruptions by people who come late and sit in the wrong seats! 3. An Irish song “Toss The Feathers” played admirably by the band led by the fiddler. 4. This is a group of Indian Dancers enthralling the sell out crowd. 5. In 2015 The Citadel’s Regimental Band and Pipes returned to the invitation-only, world famous Royal Edinburgh Military Tattoo in Scotland. It is a month-long nightly event of music, pageantry and demonstrations by military organizations from around the world. The Citadel’s band and pipes is the only U.S. military college band to have ever been invited and will be “America’s Band” in 2015. 4. Here we have the Top Secret Drum Corps from Basel in Switzerland – what a brilliant act, a real favourite at the Edinburgh. I especially liked the Top Secret Drum Corps. I’d seem them before on YouTube and I was especially glad to see them live. I loved when they whipped out fifes that looked like drumsticks and played Scotland the Brave. 5. This is video of a band who have joined us all the way from the Republic of China – The Military Band of the People’s Liberation Army of China. I liked how they sang as well as played their instruments. 6. Here we have “Hector The Hero” performed admirably on the castle esplanade. Hector the Hero is a well-known traditional Scottish Air written by James Scott Skinner and played in the key of A. What a haunting melody! There were a few others I might add later but this is enough for now! This video is the Royal Air Force (RAF) band in action, heading to the start of the finale. This is the rousing finale of “Scotland The Brave” and “The Black Bear” as they exit the esplanade and walk back to barracks via the Royal Mile – quite superb!